Geometric Design comes in all different shapes and sizes, offering optical illusions and powerful colours. When you’re selecting the perfect print for your bedroom, some may seem more daunting than others, but when styled right they can look super modern and neat, yet fun, adding a pop of colour to yours, or your kid’s bedrooms. The bedroom is possibly one of the most important rooms in a home. It’s where you get the rest you need to power you through your day, but it’s also a place for relaxation, lazy weekend mornings, or hours filled with fun and play. 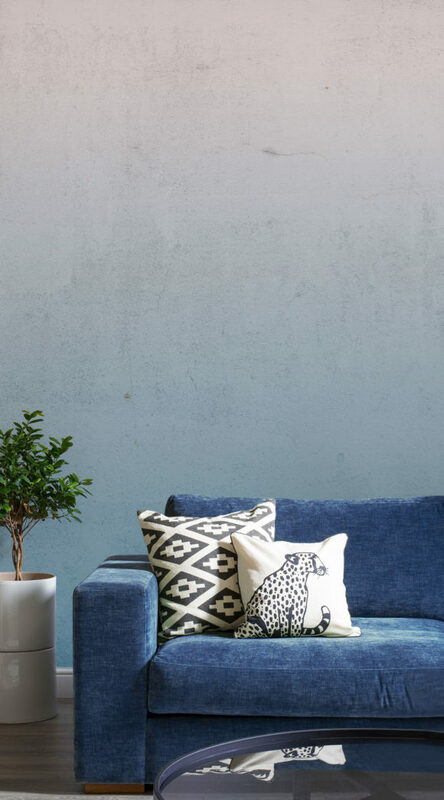 It is important that this space makes you feel happy, content, but most of all comfortable in your surroundings, and what better way than to be surrounded by beautiful design. Adding a feature wall to you bedroom can transform your space into something spectacular, without a whole lot of effort – which gives you more time to enjoy the space you’ve created. 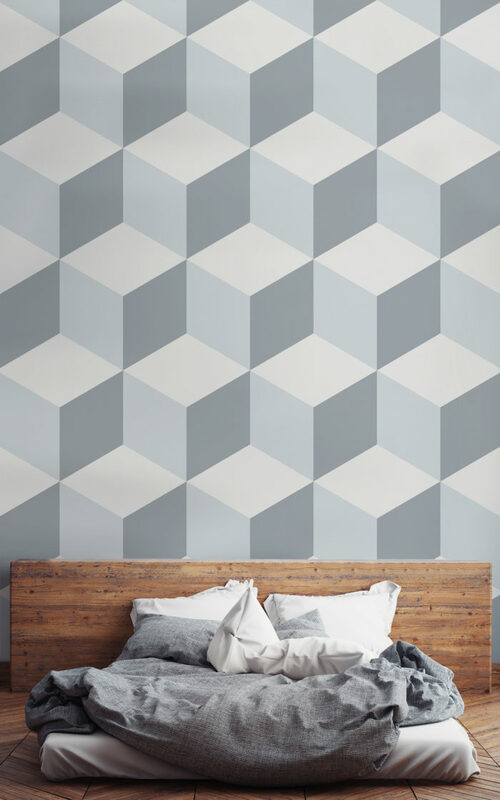 The 3D Cubed Geometric wallpaper is perfect for those looking to add multi-dimensional layers and textures to their bedroom in a sophisticated way. The 3D effect of the cubes gives the room depth, and can also act as an optical illusion, creating the idea of a bigger and more spacious environment. The muted tones of light grey and white act as calming factors, creating the perfect room for relaxing and letting all of your worries lift off of your shoulders. Styled with simple furniture like the wooden framed bed and clean neutral bedding, this room makes for quite a minimalist and masculine space, that is on trend and far from boring. 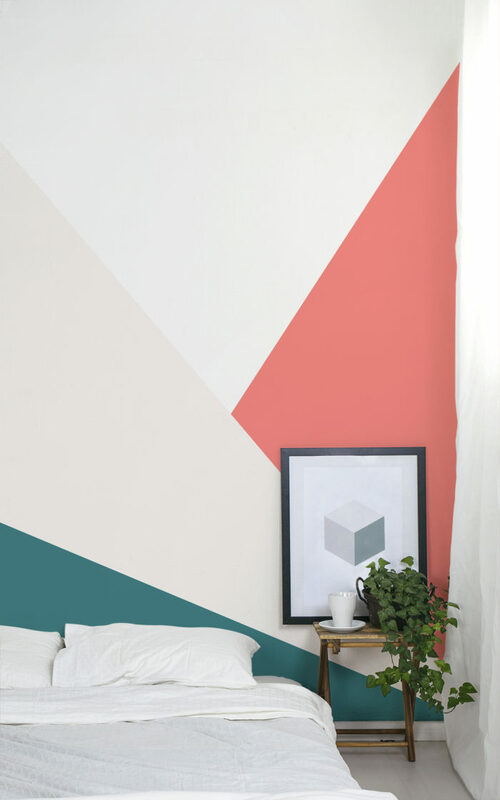 If you’re looking to achieve a more chic and stylish interior or trying something a little more bold, the mid-century modern geometric designs are a brilliant choice for your bedroom. 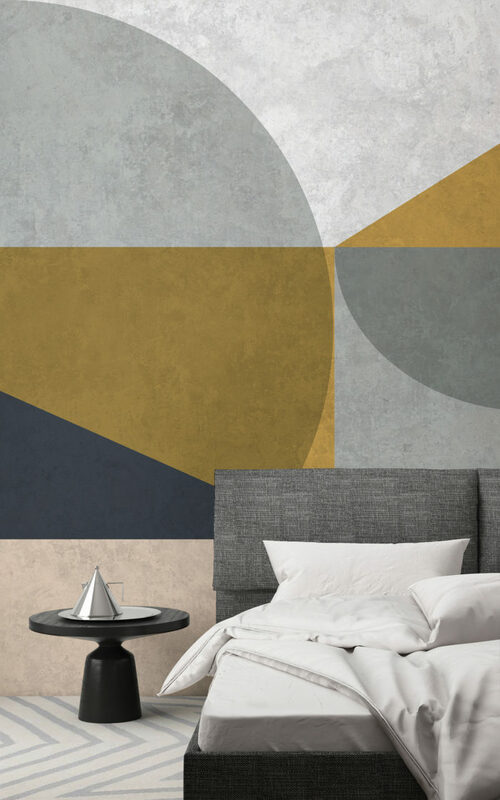 The large geometric shapes, and concrete textures within the designs make for super modern, powerful feature walls, whilst adding enough colour to warm up the room. 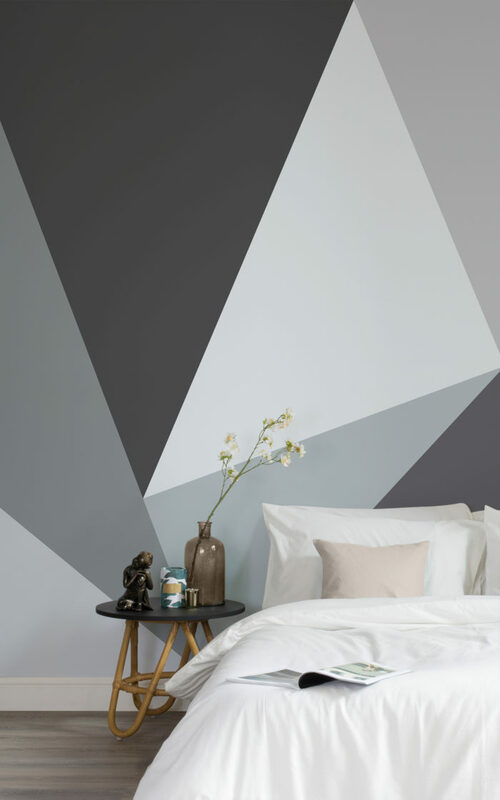 We have paired the Nico Geometric Wallpaper with simple masculine furniture and accessories, and white clean bedding, allowing the mural to take centre stage. 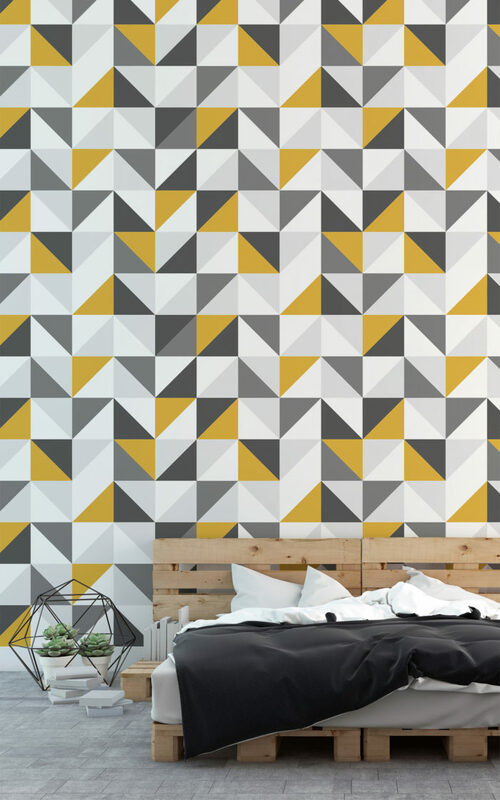 There are also geometric wallpapers perfectly suited to the younger generations, that add more fun and playfulness to a room. 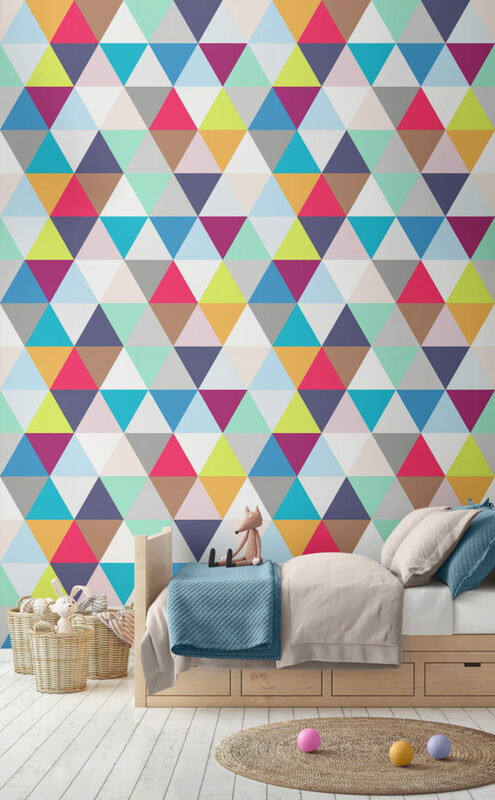 The Multicoloured Geometric Triangle wallpaper is busy with colour and fun. Adding this mural to a kids bedroom will brighten up the space with pops of colour, enlightening your child’s imagination and making for many fun hours playing around. The rainbow of colours featured in the design stimulate young minds and fill any room with joy. Paired with fun furniture and simple accessories, this mural makes for a great feature wall in a kids bedroom or nursery. 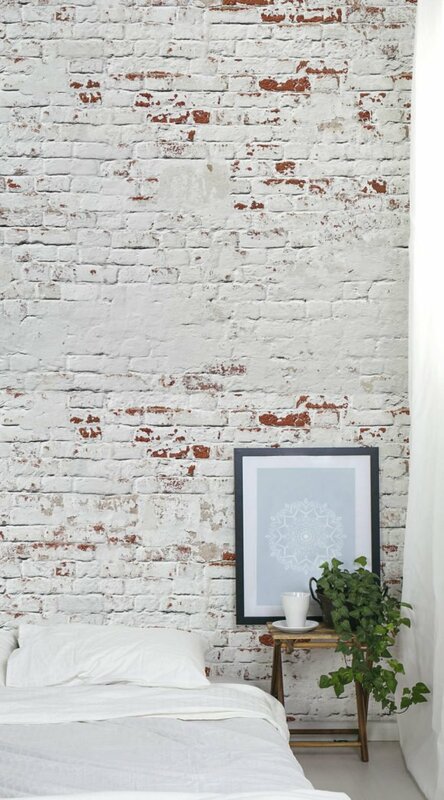 The beautifully bespoke geometric wallpaper designs hardly need any additional styling for them to look great in a room. 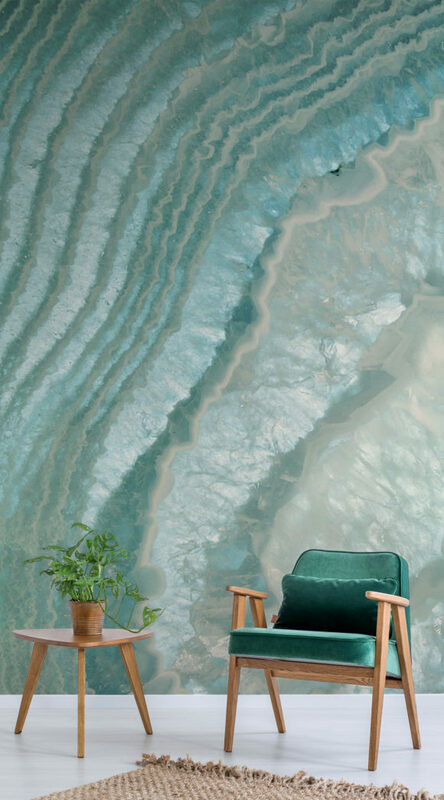 Choosing to install a feature wall with a mathematical minded mural is a great and cost efficient way to transform a space into something spectacular.